The increase in this type of work — to propellers, in particular — follows the recent introduction of the European MRV regulation which has seen more shipowners look at ways of further reducing fuel consumption (and emissions) when operating to and from European ports. The EU MRV (Monitoring, Reporting, Verification) regulation entered into force in July 2015. It mandates shipowners and operators to monitor, report and verify CO2 emissions for vessels larger than 5,000dwt calling at any EU and EFTA port. Data collection requirements became effective on a per voyage basis in January 2018. An example of the company’s performance-enhancing upgrade work was a recent project carried out on a 229m-long bulk carrier berthed in Bremerhaven. In this case, the bulker’s five-bladed propeller was modified to achieve optimum efficiency at lower speeds. Fuel savings, although important, are not the only reason to carry out propeller modifications while ships are afloat. 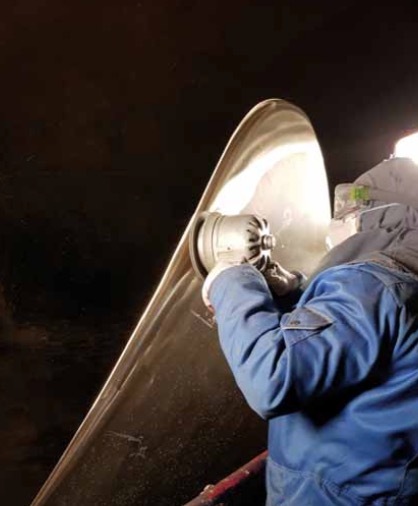 A further case study shows that after several ice-going vessels suffered propeller damage due to harsh winter conditions, resulting in the blades needing to be cropped, the customer was keen to reduce the risk of his other ships suffering similar damage from ice and other debris in the future.